1) Appearance - pretty cool. Ceilings extremely high, and for the shape of the space (ceilngs are on an angle, much like an old barn), they can do something more interesting with the ceiling like add beams or something. Anyway, cool decor, comfy atmosphere, dance floor area in the back, and very tall booths, offering privacy. Dark ambiance. 3) Portions - not huge. We went for dinner, I was hungry before, and hungry after. I ordered the penne with a rose sauce. It also had veggies in it. Next time I would add chicken or something to it. 4) Taste - I enjoyed it. They also have incredible martinis. 5) Price - average I guess. Not cheap, but not expensive, either. 1) Appearance - hip, sleek, dark. I like the booths. 2) Service - (see above, what Amal said) Only reason we stayed and didn't just bolt across the street to Hooks was because they were closed. It was late on a Sunday night, and we didn't feel like driving some place else. Martini's are actually pretty good though. 2) Service - went there for take out. It was fast, and friendly. 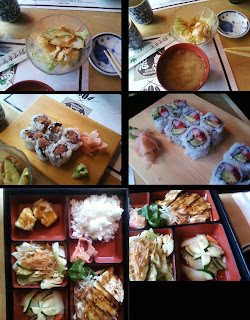 3) Portions - same as every other sushi place -you order the amount you want. They also have all-you-can-eat for dine-in patrons. 4) Taste - delicious! 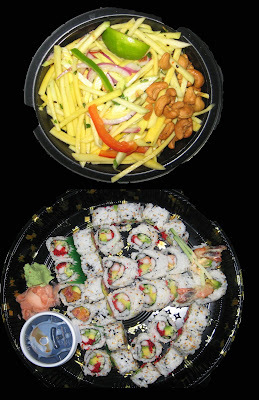 Had the crispy spicy tuna, dynamite rolls and california rolls. 1) Appearance - nice, I like it. It's comfortable too. Good lighting. 2) Service - fine. Like Amal said, we only went for take out. 4) Taste - good, no complaints, would definately go back. 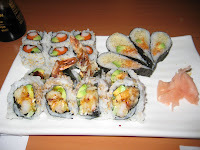 *TIP* This sushi joint is right off the 403 at Brant street, directly south of the highway. It's a nice place to grab sushi and continue down Brant street to Lakeshore (a 5 minute drive down the same road), and go by the water and eat. Burlington offers a beautiful shore-line, with much to see and do. 1) Appearance - cute, very port-ish, with the wood floors, fisherman accessories. Of course it boasts the BEST view of the lake of the entire Port Credit area. It sits directly on lake Ontario, offering a long pier right off the restaurant patio. It is nestled very comfortably between the pier and boats. Beautiful in the winter and summer. 3) Portions - good. 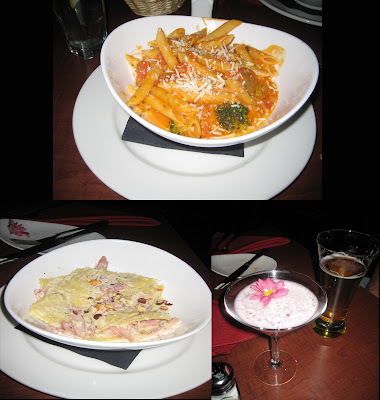 We opted to share a few different items off the menu. 4) Taste - meh. Really, very meh. Nothing that you order there, you'd ever want to order again or crave. It doesn't taste bad, it just doesn't taste good. 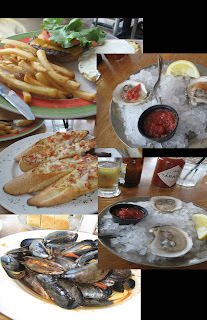 We ordered a couple of oysters (daily special at $3.00 each), an order of Mussels with the tomato sauce, an order of bruschetta, a 'backyard burger' with some fries. The Oysters were fine. Mussels were....OK. Burger was a little dry, and fries were pretty gross. You can get better fries out of those kiosks you find at fairs and stuff. This restaurant is definately only good for the view, and drinks. Seriously, don't waste your money. 5) Price - average. But for the taste of food you're getting, perhaps above-average. came to about $65 with a few apps, and 2 drinks. *TIP* Really a beautiful location in terms of where it is in Port Credit. Lots of other bars nearby, cute shops, used book stores, etc. Great to walk around port credit/lake area. Go to one of the parks nearby for a leisurly, beautiful walk, and if you need to, go to snug harbour for a relaxing view. But, there are also other great places to go, or grab a drink from the nearby starbucks and walk around, OR just BYOB/F and go for a picnic!! 3) Portions - you order as much as you want - it's pizza! 4) Taste - phenom! I love this pizza. Not greasy. Great tasting cheese. My fave is the sundried tomatoes with spinach and feta cheese! I love their dough, too. 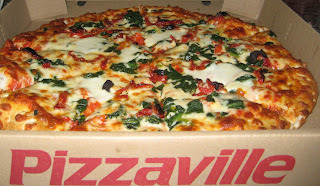 3) Portions - large pizza was good for the two of us with left overs for me in the morning! 4) Taste - we had feta cheese, sun dried tomatoes and spinach...very tasty! 5) Price - $10.99 for a large if you pick up! Sweet deal! 4) Taste - pretty good. Not the greatest, but would definately go back if we were in the area. 2)Service - Good - you can order from the table, but I think it's faster to order from their cash (think fast-food) but it's not fast food at all. 4) Taste - one of my favorite places! *TIP* One of the best sushi joints in Burlington! 2) Service - ...interesting....to say the least. I can't say that the service is BAD there, but I can say it's not comfortable. When we were there just a week ago, our main waitress dictated the daily specials and whatever else schpeel she had to say in a very strange robotic voice, staring head on like a deer caught in headlights. See Chris's review on service for more details. But I would like to mention that at the end of the meal, we asked for toothpicks from a different server (they serve in teams there) and it was awkward. We asked for toothpicks, she paused, looked confused and said, "uhh...how many?" and we answered "well....there's two of us...soo..." and she paused again and said, "so, like...how many?" and we said "like....two?" (so awkward) and she returns with two frickin toothpicks. 1) Appearance - nice, more spacious than the one in toronto. You can see the kitchen. 2) Service - kinda interesting. I ordered a burger with fries. They have great fries. I wanted mine well-done. So our deer-caught-in-headlights server asked, "WELL-done?" I said, "Yeah." so she replied, "you mean well-done as in dry and lacking flavour?" to which I uneasily agreed....wtf? 2) Service - We ordered ribs and they came to the table cold. We had to wait while they took them back to warm them up. Not cool. 4) Taste - great, but the ceasar salad isn't all that. Too musch garlic. 1) Appearance - I like it. It was dark. I like dark places. 2) Service - it was fine. 4) Taste - their ribs are good and I don't even like ribs. I'm a fan, now. 1) Appearance - looks big because of the mirrors, but it's actually tiny. Nice booths and tables. Except for the deuce right at the front entrance. Cozy place. 4) Taste - very good except for one thing: The green salad sauce tasted a little like mayonaise. *Note: This location is not to be confused with their King Street location. There is no website currently for this location, which is at the Beach in Toronto. Although they are sister restaurants, it appears they differ greatly. 1) Appearance - we almost didn't go in, but then the "all you can eat" sign caught our attention. It is a small space, with tables and chairs througout. Since there are no banquettes or no real dividers, you get no sense of privacy or intimacy. It's almost like being at McDonalds. Everything is out in the open, so if you are the only two in the restaurant (as were Chris and I), we felt that our conversation was 100% audible to the chef and waitress just 4 feet away from us. Overall yellow/orange look ,but doesn't feel warm at all. I kind of liken it to a more neon sunset grill. 2) Service - nice, but although the restaurant was puney, the waitress was hard to get a hold of. At one point the sushi chef took our second order, but he was very nice. 4) Taste - very salty. Green salad was very, very good. But the sushi rolls (we had crispy tuna, kamakaze, gyzoa dumplings, california rolls, dynamite rolls, beef terryaki) were all sooooooooo suuuppper salty. The Soy sauce was literally un-edible. It was waaaaaaaaaaayyy too saltyAfter our first round, Chris and I both had numb tongues. They were literally numb and tingling. We thought it may have been something from the food, but soon discovered it was from the soy sauce, so we couldn't use it. Not cool. The rolls also left us feeling very dehydrated....salt-city. The beef terryaki was good, but it was the type that was mostly raw...not my personal fave, and not too flavorful either. 5) Price - over priced for the weird soy sauce and terrible feeling it left in your tummy after. 1) Appearance - not the coolest looking place. Kinda ghetto-ish and uninspiring. We walked around the beaches area and were hungry and kinda settled for this place. We saw a lot of japanese restaurants on the way home...hmmm...i would advise you try some place else. For $50 i'm gonna say save your money or go somewhere else. Do Not Devour this Food.